Protect and complement your Samsung Galaxy S10+ with the LED Back Cover Case from Samsung. This multifunctional case protects your Galaxy S10+ while also showing you LED notifications on the back side of the case. The back cover colorful LED lights will notify you of incoming calls, messages, time, and more. You can even create and assign custom LED icons for events and contacts using the built-in icon editor. 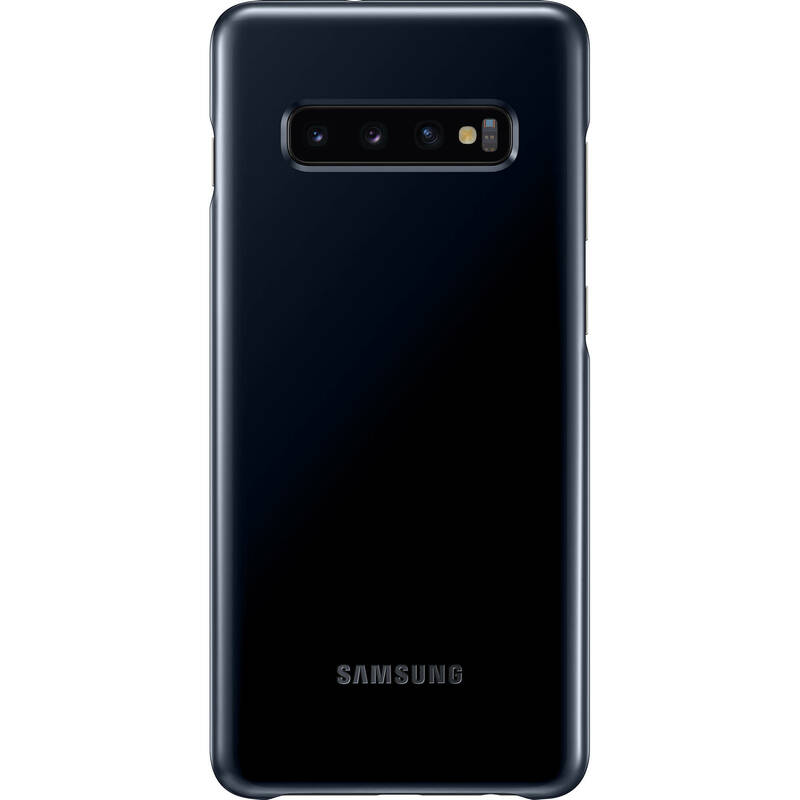 This case also features an LED light on/off sensor that will intuitively control how much light is illuminated based on your Galaxy S10+'s battery life. A shell-type design offers enhanced protection for your smartphone, while the fabric-like material makes the grip comfortable in your hand. The back cover's LEDs let you know when there's an incoming call, or when an alarm goes off. You can respond and control these notifications by swiping the case itself. You can even assign custom icons to your contacts for a fun spin on caller ID. 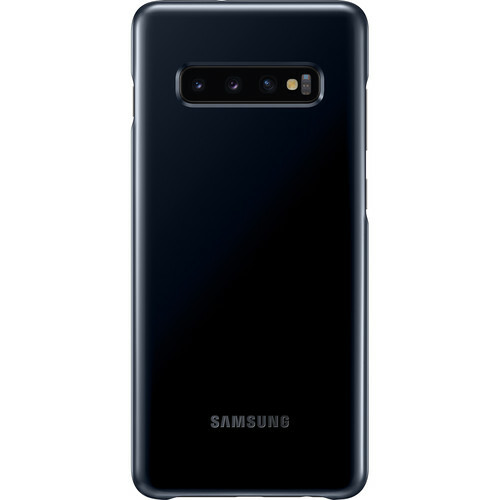 Box Dimensions (LxWxH) 7.8 x 4.7 x 1.0"
LED Back Cover Case for Samsung Galaxy S10+ (Black) is rated 3.0 out of 5 by 8. Rated 4 out of 5 by TechFan21 from Slim case with some cool tricks, but very slick I bought this case thinking it would have some grip to it because it's description says "fabric like" but the only part of the case that is fabric like is the inside to protect the glass back from scratches. This case is very slick in hand and picks up fingerprints and smudges easily. BUT I do like how thin it is, I hate big bulky cases. Also, the LED lights are pretty cool! You can set them to light for different notifications, for certain contacts, when you're taking a pic with the timer on it'll countdown on the case. Some cool stuff so gave it 4 stars because of the extra things the case could do, just as a regular case, it's only a 3 star. Rated 1 out of 5 by Notsohappybuyer from Terrible and Misleading Bought it because i thought i was going to be able to customize it a lot more and it would still blink the notification until you answered it well that isn't true. Also there aren't Colorful LED's its just white and that is it. The unit shuts off after about 10 minutes and then you have to turn it back on. Terrible investment and you can't customize the icons like it says you can either. That's false advertising. Rated 1 out of 5 by Fabo from Turns off after 10 minutes The software for this case is defective. The case turns off on it's own after 10 minutes. Have to go back into settings to turn it back on. I searched online for fixes and many other users are experiencing the same problems. I don't think it's the product itself but the actual software for it. Rated 5 out of 5 by Jokeachild from Beautiful Case I love this case. It has all the features that I wanted and it just makes my phone feel slim.